after a long week at work 3;30am starts I have finaly dragged my sorry but out of bed. Its the first day of special goose season and if he ever behaves for ten minutes so I can finish getting ready I will take my lad out to see if we can find some young dumb ones to put in the freezer. Iwill let you know how we get on. Go for it Elvis, good luck to you and the your lad. Blast a couple for me Elvis...don't fergit them pics mate...be great to see you and your young tacka enjoying the hunt mate. 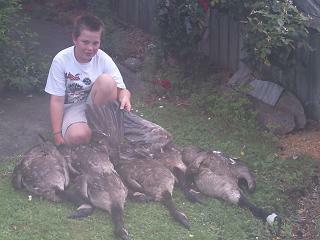 6 geese 1 salmon1lb and a 2lb rainbowtrout. very sunburnt but we had a blast. Thumbs up on the critters mate...well done. Looks like you have a good feed for the weekend barbie. BIG thumbs down on the sunburn mate...not good. Make sure you take a good quality 30+ sunscreen out with you...I'd hate to see you or your young'uns end up like me mate, with a mass of scars from having sun damaged skin frozen and cut off. This last one has shown me just how easy it is for things to go bad mate. we did the sunscreen thing TWICE it was overcast but the sun just burnt its way through. thats not a springer spaniel either guys its me wee cocker and the goose was very much alive too. Elvis, sounds like a great day! Its always nice to have a picture, but next time don't spare the pixels. Under a magnifing glass I can tell that there is water and feathers. Thought for a moment there, you might have been reeling in a goose and the trout at the same time. Good luck Elvis and have some fun. slimjim I took photo off my camera them emailed it home. I will take a photo of the birds this morning with my camera and post that a bit bigger for those whos eyesight is not so good any more. I took photo off my camera them emailed it home. Quite often, email applications reduce the resolution of a picture to make it send quicker. You have to select making the picture retain its resolution or it becomes smaller. I bet if you check your camera, the original picture is still there in all it full resolution and glory! Post the original and we could make out them main player in the shot! !